A piano is difficult to move. It is heavy, awkwardly shaped, and delicate all at once. Properly moving one requires specialized equipment, techniques, and knowledge to avoid damaging the instrument or the property and people around it. From an assortment of Grand & Baby Grand pianos, as well as Upright pianos (Studio, Console, and Spinet), there are many different sized pianos. 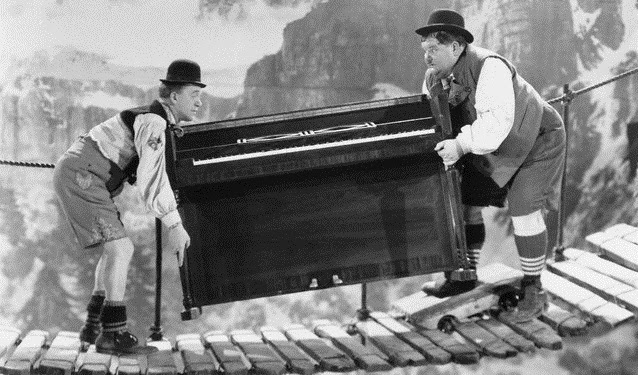 The lightest vertical pianos made today are still over 350 lbs. while the heaviest uprights are over 900 lbs. Grand pianos are worse. They can be as little as 500 lbs. but some large concert grands can be as heavy as 1200 lbs.! When trying to move a piano, it takes only one small slip to lose control of the instrument. The result can be very expensive for repair of the piano, your floors and walls, not to mention the physical injury that might occur to the inexperienced movers themselves. Trust our experts to protect your valuable investment with our professional moving teams. Our insured pros have the right equipment to move your piano in any situation whether it be from the garage to your living room, across town or across the country, up flights of stairs or placed upon a concert platform. We understand just how important it is to keep your piano protected during any move… after all, pianos are our passion. Our years spent refurbishing, maintaining, appraising, and selling high-quality pianos have allowed our professionals to become acquainted with all piano types and brands, all of which have their own idiosyncrasies that come into play during a move. Whether it is moving your piano across multiple cities or to a different part of the house, we take piano storage seriously. If you are looking for a secure place to store your piano, Award Piano provides climate-controlled storage facilities to many counties throughout Fort-Worth Dallas, including Tarrant, Denton, Johnson, and Parker. We will even help you transport it. Award Piano provides climatized storage facilities as well as piano tuning & repair and offers a discount when you bundle services. Since the late 1890′s the McBrayer Family has made piano service it’s number one priority and over the years, thousands of satisfied customers have trusted their treasured instruments into the hands of the experienced McBrayer pros. Won’t you? Contact us today for a free estimate. Fort Worth, Dallas, Grand Prarie, University Park, Highland Park, Frisco, McKinney, The Colony, Plano, Allen, Southlake, Keller, Kings Ranch, Westlake, Trophy Club, Roanoak, Flowermound, Highland Village, Lantana, Grapevine, Arlington, Coppell, Lewisville, Addison, Farmers Branch, Valley Ranch, Las Colinas, Irving, Hurst, Euless, Bedford, Colleyville, North Richland Hills (NRH), Watauga, Parkglen, Saginaw, Bluemound, Justin, Denton, Lake Worth, Eagle Mountain, Lake Country, Azle, Springtown, Weatherford, Aledo, Annetta, Willow Park, Hudson Oaks, Granbury, De Cordova Bend, Pecan Plantation, Glenrose, The Retreat, Hulen, Mira Vista, Edgecliff, Rendon, Everman, Burleson, Joshua, Cleburne, Alvaredo, Mansfield, Midlothian, Waxahachie, Ennis, Cedar Hill, Duncanville, Desoto, Lancaster, Red Oak… Service areas include commonly a 300 mile radius such as Houston, Austin, San Antonio, Ablilene with shipping available almost anywhere.